Teachers and students learning together in 21st century classrooms are capable of achieving great things. Devices allow students to connect, communicate and collaborate online and publish their work for a global audience. Any content published online will begin to create a digital footprint for each individual. As educators, we need to ensure we model and teach our students how to post content to ensure the digital footprint they are creating is positive in nature. As teachers we have a duty of care for our students. 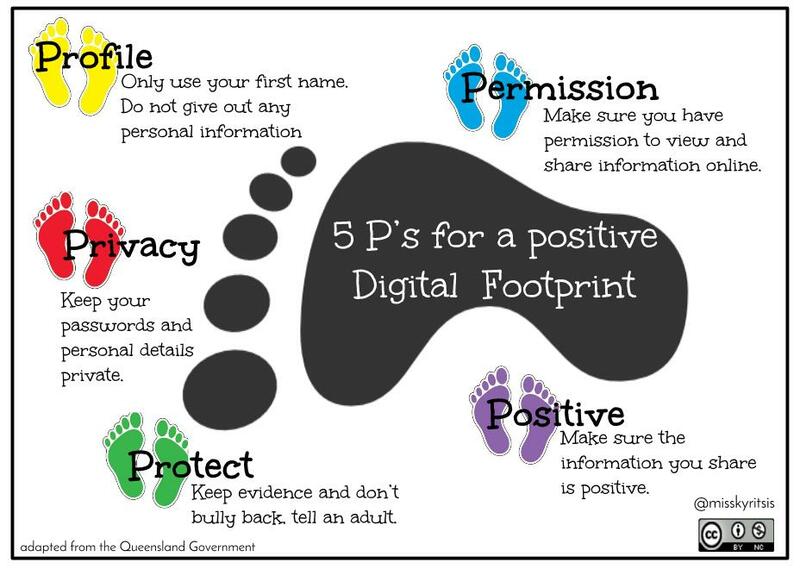 The 5 P’s for a Positive Digital Footprint, developed by the Queensland Government, is a great framework to implement in classrooms. It ensures students understand positive behaviours and protect themselves by posting content that will not reflect or identify themselves to the global community. My school would like to print this graphic on a poster for our classes in grades K-2. I want to respect the creator’s rights. Would this usage be alright? Thanks Eleni…I will certainly share this with all of my schools. Thanks for sharing, such an important step to take for students and teachers alike.